Ss. Agnes and Pancras is a beautiful inner city parish church in the heart of Liverpool. It is situated on the corner of Ullet Road and Buckingham Avenue, close to Sefton Park. Consecrated in 1885, it was built at the expense of Mr H. Douglas Horsfall, who also founded St Chad's Theological college in Durham. The building was designed by John Loughborough Pearson and is Grade 1 listed. The Parish is affiliated to Forward in Faith, and is under the extended episcopal care of the Bishop of Beverley, the Right Reverend Glyn Webster. Father Derek Lloyd was installed as Parish Priest on 28th September 2017. Mass times and notices can be found here. A virtual church tour is available online. We have a number of parish development projects currently running. News and upcoming events can be found here, and on our Facebook page here. 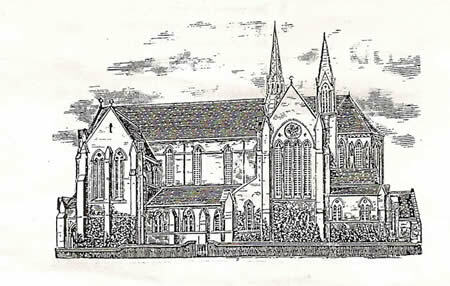 This Church, dedicated to two early Roman martyrs, who died rather than renounce the catholic faith, seeks always to proclaim that same faith to the people of Toxteth Park, bringing God to his people and the people to God. As a welcoming and caring community we seek to provide traditional and beautiful worship in our magnificent church, in order to give people a sense of the majesty of God and of the dignity and purpose of all creation. Please assist us in maintaining this wonderful building to the glory of God. Please click here to register with easyfundraising giving St Agnes Church Liverpool as your chosen charity, and use that website to log on to the retailers listed there. Again, we shall receive a donation based on your purchases, at no extra cost to you. Click here for some more detailed instructions.